Marshall M. Fredericks Sculpture Museum | Sketches for "Flying Gulls Fountain"
Sketches for "Flying Gulls Fountain"
This delicately balanced sculpture is evidence of Fredericks' expertise in design and structural engineering. The openness and verticality of the composition are very dramatic. The large gulls appear weightless, held in place only by a wing tip, giving the illusion of flight and movement. Fredericks reinforced the elegance of the composition with the smooth surfaces of the gulls' bodies and wings, only slightly suggesting feathers and other details. To complete this airy construction, Fredericks utilized lightweight aluminum to cast the gulls for a fountain at the Civic Center and Loutit District Library Plaza in Grand Haven, Michigan. 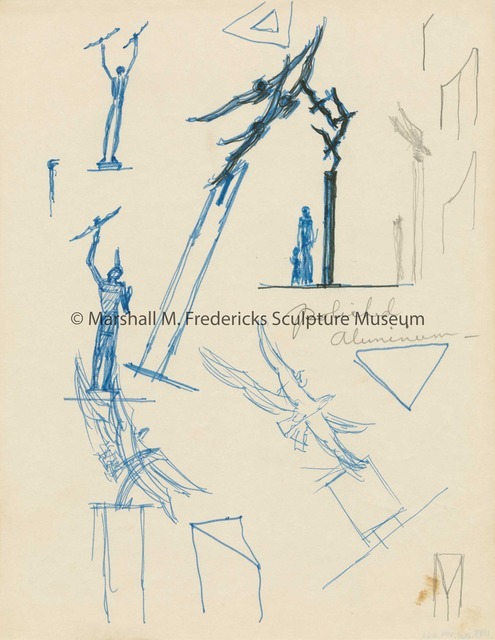 Fredericks, Marshall M., 1908-1998, “Sketches for "Flying Gulls Fountain",” Marshall M. Fredericks Sculpture Museum, accessed April 21, 2019, http://omeka.svsu.edu/items/show/6697.